The Col Nudo is a mountain in the Alps located in Italy. 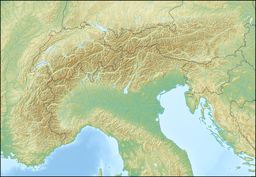 It is the highest peak of the Venetian Prealps and the 30th most prominent summit of the Alps. Administratively the mountain is divided between the Italian regions of Friuli-Venezia Giulia (province of Pordenone) and Veneto (province of Belluno). ^ Marazzi, Sergio (2005). Atlante Orografico delle Alpi. SOIUSA (in Italian). Priuli & Verlucca. p. 294. ISBN 978-88-8068-273-8. This page was last edited on 17 April 2017, at 06:13 (UTC).